So I’m not sure why this is hitting me this year, maybe from being at a family memorial recently, maybe because I’ve never shared this outside of a few family, maybe because of fewer ceremonies outside of media events, or maybe my mind just needs to get this out as some sort of therapy. Regardless of if this is read by anyone, here is some of my story. I was hired at United Airlines in January of 2000. The rapid hiring and movement then allowed me to upgrade from a B727 flight engineer to a B757/767 first officer within a few months. I was based in ORD (Chicago’s O’Hare airport) and flew domestically around the United States. By my second year I was finally climbing out of poverty wages by upgrading and was enjoying my layovers, especially Boston, being a Red Sox fan. I would fly several flight numbers which would be better known in September of that year. The morning of 9/11 I headed in to ORD flight ops for some ground training with about 20 other pilots. This was not normal for my schedule, but was some mandatory face to face training as we didn’t have online training like we do now. So I came to “work” in khakis and a nice shirt an arrived before 7:30 local (CDT). We were meeting in a conference room, right off from the flight operations rooms where pilots would meet before flights (underneath the C terminal). We were scheduled to start at 08:00. About 08:00, the instructor introduced himself, and like most meetings, we went around the room introducing ourselves. Just before that, we heard some noise from the tv room, as if a football game was on. We didn’t think much of it and continued. We didn’t finish getting around the room. The instructor left the room to check what was going on, and of course the media didn’t quite know and said something had happened in NYC with an airplane. Video was starting to focus on the World Trade Centers. Minutes later, news of another aircraft incident and more of an uproar of noise in flight ops. Initially we didn’t think it was one of our airliners involved, but minutes later training was cancelled. Most of us tried to get updates from the tv, and slowly all flight planning in the flight area stopped, and flight ops room became crowded with local pilots, those commuting, and those getting ready to continue their trips. The room turned slowly to crisis mode as we received briefing updates from the chief pilot updates on what we thought was happening as we watched the horrifying events happen on the news. My cell phone could not connect to family and the landlines were jammed. Shortly thereafter, every flight on the flight screens for ORD were cancelled. Local pilots were told to go home, and commuter pilots were asked to go home with friends or local volunteers. The hotels were packed. I found 2 pilots I knew and told them to head to the train, and where to get off for my house. Some how I hoped to get in touch with my wife and tell them they were coming. About the same time, they asked for volunteers to move planes off the gates, since none had departed, and there were at least 50 United jets, full of people who had to land and had no where to deplane. At the same time the terminal was being evacuated. I volunteered despite not being in uniform, but at least I had my chart bag nearby. My captain was dressed the same. So we headed up to a B757 parked at a nearby C gate. Our plane was parked in the alleyway between B and C terminals, so I called Ramp Tower for pushback and start sequence. Normally a pretty busy frequency, but no answer after 3-4 calls. We pushed back, and started up uneventfully. The frequency was quiet and we taxied out the “Charlie south line” to check in with O’Hare Metering/Ground control. No answer on ground metering control, so we switched to the outbound ground frequency. We needed clearance to taxi to the United hangar to get our plane out of the way. To anyone who has ever listened to O’Hare ground, this is normally difficult due to the massive amount of aircraft they control and the frequency is extremely busy. As I looked around the airport, I could see a massive amount of United airline jets parked everywhere, but no one talking on ground, just hundreds of flashing anti-collision lights from the recently landed aircraft. 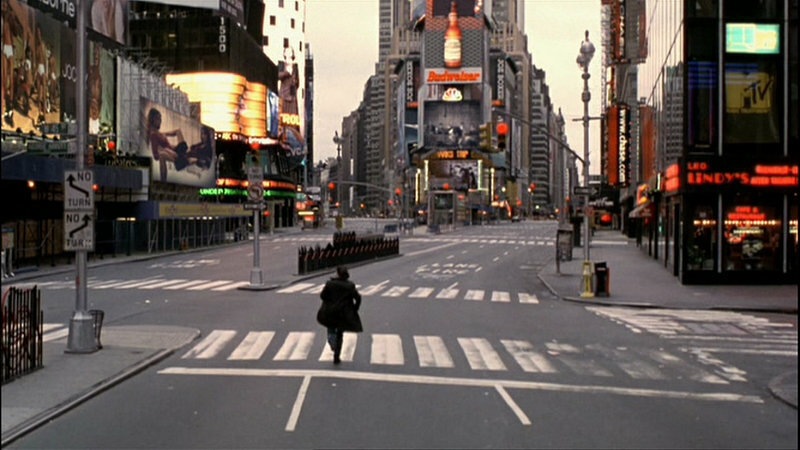 If you ever saw how eerie it was for Tom Cruise in the movie Vanilla Sky (where he was alone in Times Square), then you can understand how ORD felt at that moment. We made it out to the parking area near the United hangars and were parked a short time after. There, we could see 2 UAL aircraft being loaded up with supplies for “rescue” and emergency groups within United that would fly towards some the affected areas, pending flight clearance from the FAA. I think they eventually flew out to NY and PA late that night. We also met a ground ramper that told us that indeed, all United aircraft had been forced to land at the nearest suitable airport worldwide. There was also some panic in her voice as she told us several United jets were “un-located”. About an hour later, we were finally able to get a ride back to the terminal and flight ops. No one was there, minus a few administrative types. We were told, go ahead and head home. It was now early afternoon. At some point here I was able to get a quick landline call home to let my wife know I was coming home and with possibly with some friends..
As I walked out of the elevator I was struck by the silence. I was the only person in the terminal. 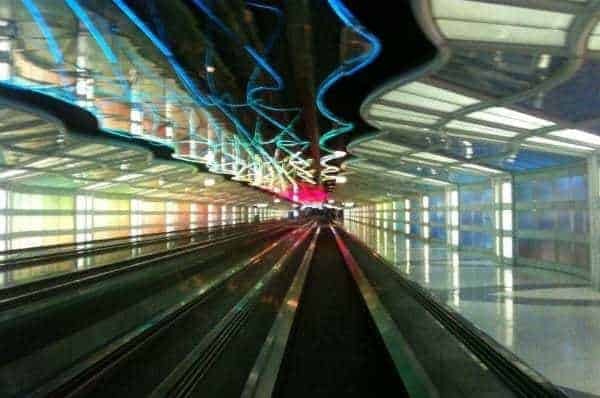 I walked through the underground walkway and up and out of the B terminal without seeing anyone. The first person I saw was an armed ORD officer with an M16 outside and a few other people trying to leave the terminal. 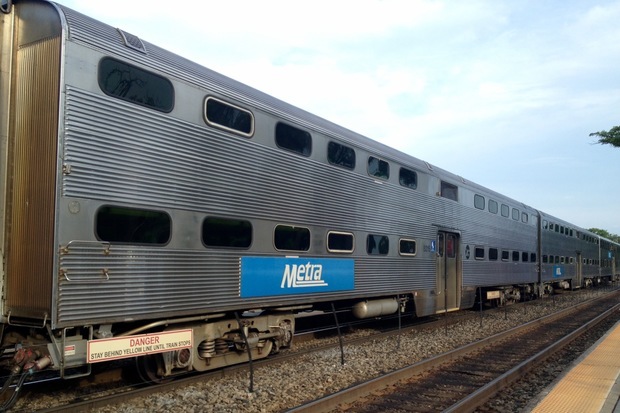 Since I couldn’t get to the employee lot where my car was, I made my way over to the Metra train stop as there was one train line outbound that goes to my town. After riding a parking lot shuttle, and walking the rest of the way, I made it to a very crowded Metra stop and boarding area. To my surprise, I found my pilot friends who i sent out hours earlier with an American pilot buddy who was using my house as his crash pad. I think about 45 minutes later, an outbound train finally came and we jumped on even though it was crowded like a Tokyo subway train, as everyone was leaving the city. The ticket taker came by for us to pay for our train ride, but seeing we were American and United pilots, he wouldn’t let us pay. We did make it home, ate a big dinner, and had many drinks that night, and pondered the possible coming changes. I wasn’t sure what would happen to the country, my airline, or my military status. Eventually, most of my panicked family was put at ease, as my wife knew I was ok, since I was not scheduled to fly that day, she could tell them when they called, that I was on the ground in ORD. Outside my house it was also unsettling as I no longer heard the hundreds of planes that normally fly over my house on their arrival to Chicago, no longer there. I’m not sure if I’ll write more, but obviously huge changes were ahead in my life, but there were too many unknowns at that point. My friends ended up staying at my house for about a week before they could make it home. I ended up volunteering to fly one of the first flights the next weekend, just to get back in the saddle. Flying out of Boston only a week after 9/11 was also quite emotional. I’ll save that for another post. For the meantime, I was grateful to be home with my wife and newborn daughter. Pilots confront Norwegian on rights avoidance | Air Traffic Management | Air Traffic Management – ATM and CMS Industry online, the latest air traffic control industry, CAA, ANSP, SESAR and NEXTGEN news, events, supplier directory and magazine. Its sad that our government doesn’t seem to value US Airlines, their safety, and employees. Airlines built like this to work around European and US regulations will undermine safety in order to increase profits for the owners, and sub par pay for foreign aircrews. They need to deny “Norwegian Airlines” request to fly to the US. We don’t seem to have a National Airline Policy, and I’m often confused by one hand of the government not looking at the big picture. If this continues I don’t see good thing ahead in the long term future for US Airlines. Do you want to fly Korean Air from Atlanta to Chicago? I don’t. Emerates form NYC to LA? I’m sure they want to.